That is what Steve sees. 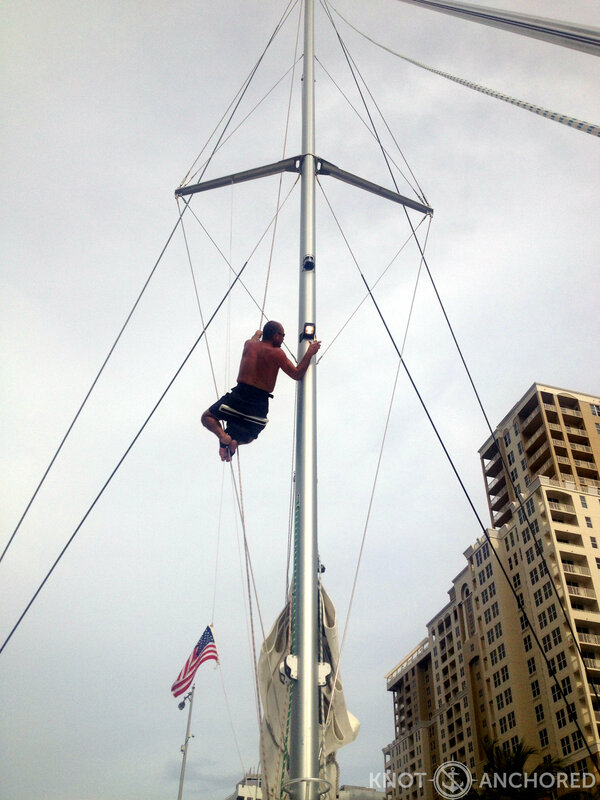 Once in awhile you have to go up the mast and fix stuff. This time it was the deck light, which is only halfway up (35 ft). Last time he went up it was all the way to the top – 70ft! Here’s what it looks like from my vantage point. I hoist him up via the windlass. Thank goodness for windlasses! A windlass is the boat version of a winch, kind of. Either way it saves me from hauling him up by cranking the handle. Now lowering him definitely has a huge trust factor. I do that by hand, slowly letting the rope off as smoothly as possible. It’s not hard but I’m sure it’s a heart pounder for him up top! If you look closely you’ll see the Subaru parked right next to the boat. Will have to say goodbye to the old girl soon as our time in Fort Lauderdale is coming to a close. Operation catamaran overhaul is almost complete!